magnetic fields induction has been detected experimentally by using a magnetic probe technique. of inter electrode discharge region. Figure 1. (a) Coaxial plasma discharge device; (b) Electrical circuit of the coaxial plasma discharge device. from 1 to 2.2 Torr. 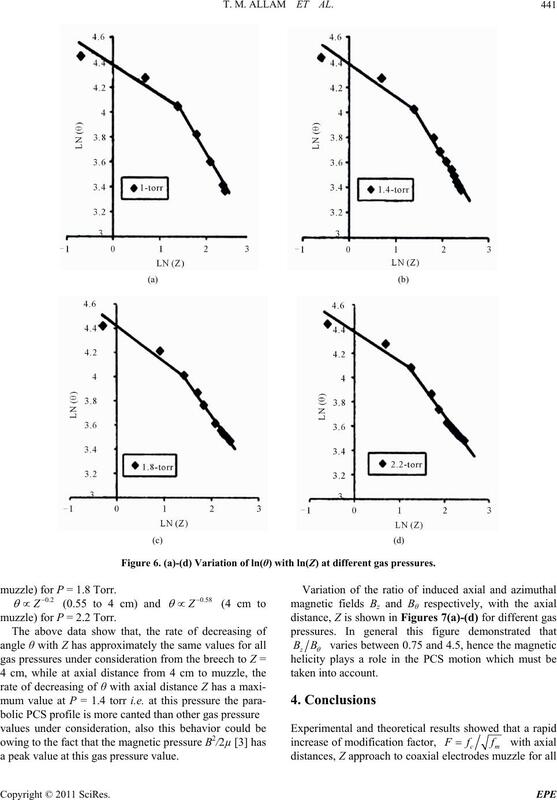 pressures and axial distances under consideration. a and outer radius, b of coaxial electrodes = 3.475 cm. ity, Va and the theoretical axial velocity, Ua . 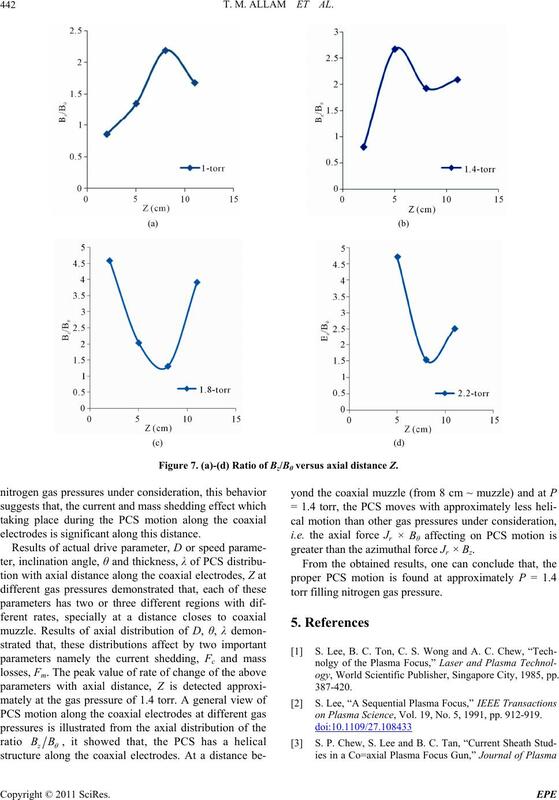 axial distance and gas pressure. T. M. ALLAM ET AL. to reach a maximum value. torr respectively and a = 2.5 cm. for Z varied from (8 cm to ~ muzzle) for P = 1.4 Torr. Figure 3. 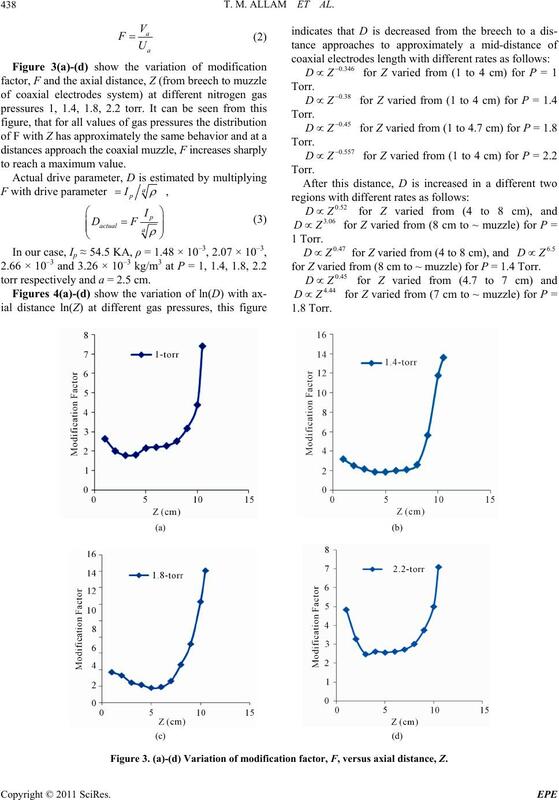 (a)-(d) Variation of modification factor, F, versus axial distance, Z. Figure 4. 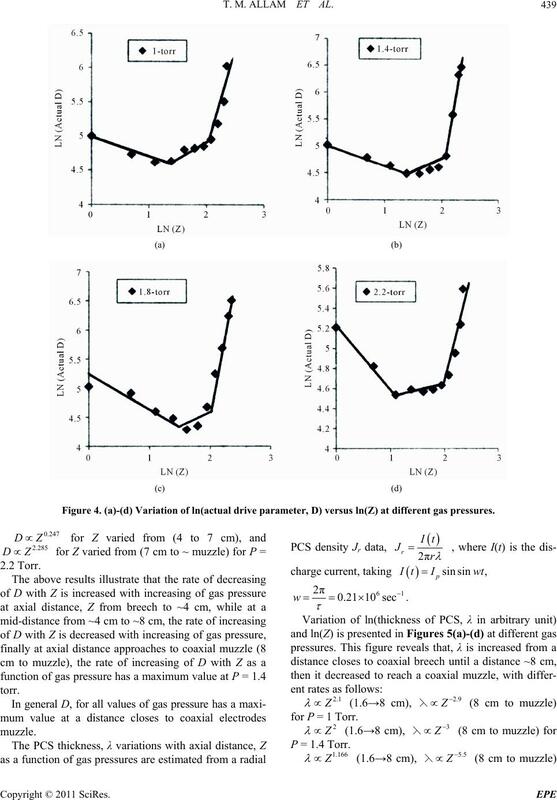 (a)-(d) Variation of ln(actual drive parameter, D) versus ln(Z) at different gas pressures. for P = 1 Torr. Figure 5. 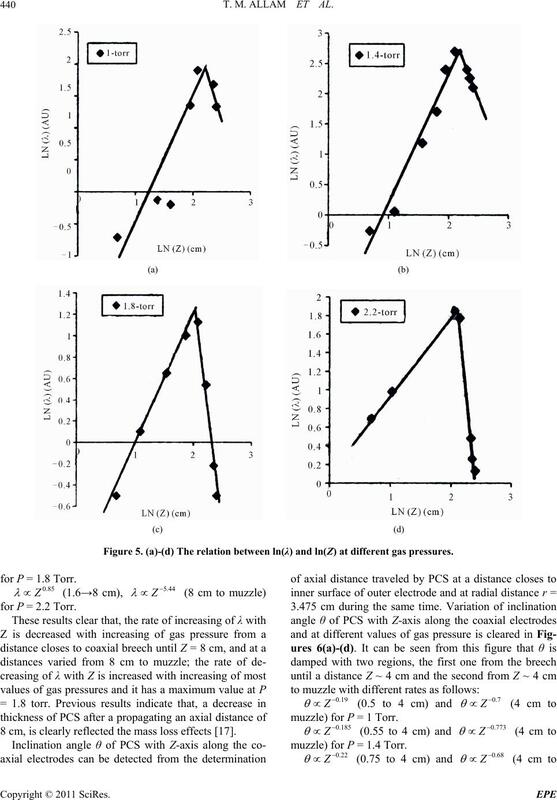 (a)-(d) The relation between ln(λ) and ln(Z) at different gas pressures. for P = 1.8 Torr. for P = 2.2 Torr. 8 cm, is clearly reflected the mass loss effects . muzzle) for P = 1 Torr. muzzle) for P = 1.4 Torr. Figure 6. (a)-(d) Variation of ln(θ) with ln(Z) at different gas pressures. muzzle) for P = 1.8 Torr. muzzle) for P = 2.2 Torr. a peak value at this gas pressure value. Figure 7. (a)-(d) Ratio of Bz/Bθ versus axial distance Z.
electrodes is significant along this distance. greater than the azimuthal force Jr × Bz. torr filling nitrogen gas pressure. ogy, World Scientific Publisher, Singapore City, 1985, pp. 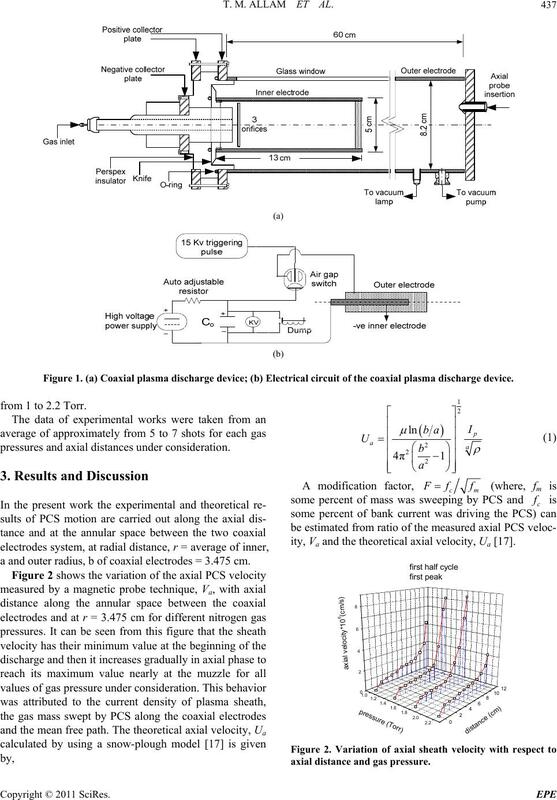 on Plasma Science, Vol. 19, No. 5, 1991, pp. 912-919. Physics, Vol. 8, No. 1, 1972, pp. 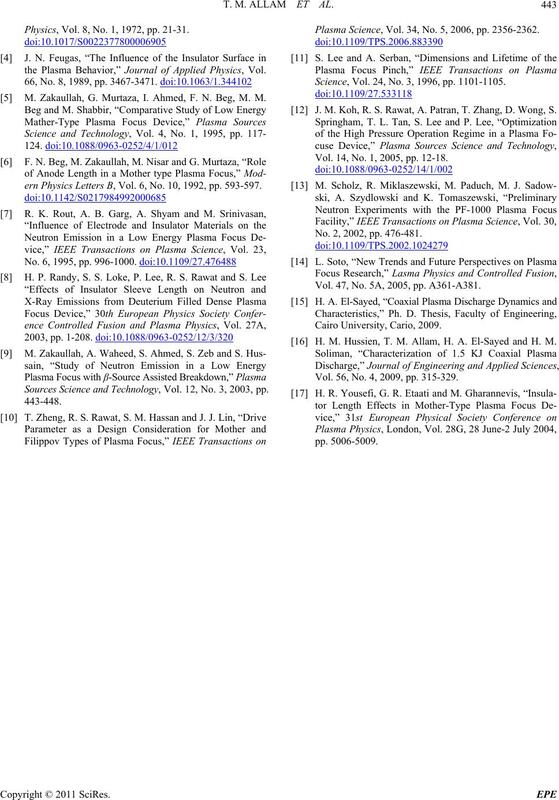 21-31.
the Plasma Behavior,” Journal of Applied Physics, Vol. M. Zakaullah, G. Murtaza, I. Ahmed, F. N. Beg, M. M.
ern Physics Letters B, Vol. 6, No. 10, 1992, pp. 593-597. Sources Science and Technology, Vol. 12, No. 3, 2003, pp. 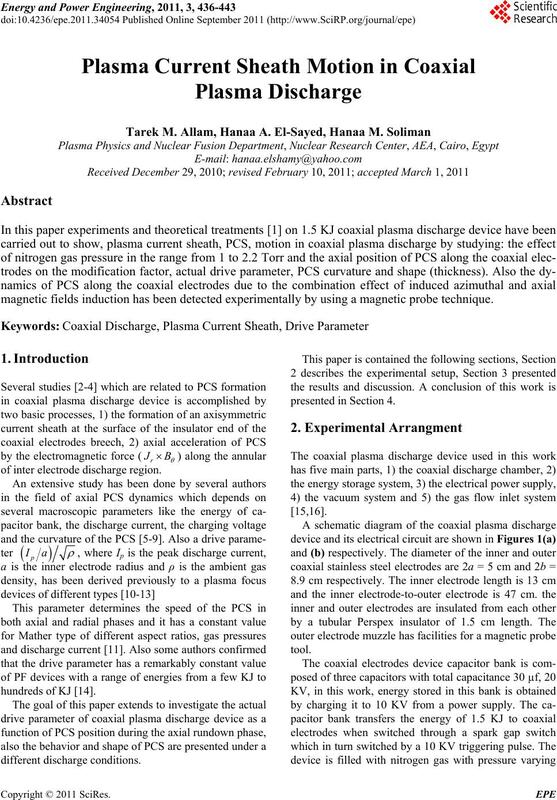 Plasma Science, Vol. 34, No. 5, 2006, pp. 2356-2362. Science, Vol. 24, No. 3, 1996, pp. 1101-1105. J. M. Koh, R. S. Rawat, A. Patran, T. Zhang, D. Wong, S.
Vol. 14, No. 1, 2005, pp. 12-18. No. 2, 2002, pp. 476-481. Vol. 47, No. 5A, 2005, pp. A361-A381. H. M. Hussien, T. M. Allam, H. A. El-Sayed and H. M.
Vol. 56, No. 4, 2009, pp. 315-329.